Reflections for Lent is designed to enhance your spiritual journey through the forty days from Ash Wednesday to Holy Saturday (14 February - 31 March 2018). Covering Monday to Saturday each week, it offers reflections on readings from the Common Worship Lectionary, written by some of today's leading spiritual and theological writers.Each day includes:* Full lectionary details for Morning Prayer* A reflection on one of the Bible readings* A Collect for the dayThis volume offers daily material for 14 February to 31 March 2018, taken from the Reflections for Daily Prayer 2017/18 annual edition. It is ideal for individuals and groups seeking Lectionary-based reflections for use during Lent and Holy Week, or for anyone wishing to try Reflections for Daily Prayer before committing to a year's worth of material. It also features a simple form of morning and night prayer and a guide to keeping a good Lent. 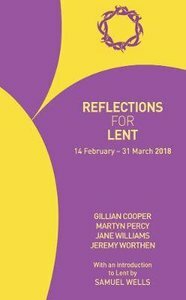 About "Reflections For Lent 2018: 14 Feb - 31 March 2018"
Gillian Cooper is a writer who has previously worked as a theological educator. Revd Canon Prof. Martyn Percy is Principal of Ripon College, Cuddesdon. He is a regular contributor to Radio 4, The BBC World Service, The Independent, The Guardian and other media. His recent books include Salt of the Earth: Religious Resilience in a Secular Age (T&T Clark), Engagements: Essays on Christianity and Contemporary Culture (Ashgate) and Clergy: The Origin of Species (Continuum). He has studied at the universities of Bristol, Durham and London. He currently holds an honorary Chair in Theological Education at King's College London, as well as an Adjunct Professorship of Theology and Ministry at Hartford Seminary, Connecticut, USA. He is also Canon Theologian for Sheffield Cathedral and co-ordinates The Society for the Study of Anglicanism at the American Academy of Religion. Jane Williams was born in India, one of five sisters, and read Theology at Cambridge University before going on to work in theological publishing and education. She has published, amongst other things, Bread, Wine and Women (with Sue Dowell); Perfect Freedom, Lectionary Reflections; Approaching Christmas and, more recently, Approaching Easter. She has also written a Sunday readings column for the Church Times. Jane now works as a Visiting Lecturer at King's College London, as a Lecturer at the St Paul's Theological Centre, and for Redemptorist Publications. Jane and Rowan (Archbishop of Canterbury) have been married since 1981 and together they have a son and a daughter. Jeremy Worthen is a priest in the Church of England and Secretary for Ecumenical Relations and Theology at the Council for Christian Unity.